If you are teaching how to skip count, Have Fun Teaching has a new counting song for kids. The Counting By Threes Song is packed with fun futuristic sounds and hip hop beats. 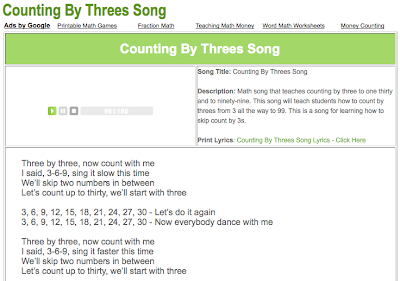 This is a Math song that teaches counting by three to thirty and to ninety-nine. This song will teach students how to count by threes from 3 all the way to 99. This is a song for learning how to skip count by 3s. Your kids will thank you for it!